For this simplistic bracelet I used basic leather cord (available everywhere) and 11/0 Japanese seed beads (not Delicas). This technique could also be adapted to make a choker or anklet as well. The one shown here is made in shades of pink, orange and purple but it can easily be done in any color scheme you choose. And, if you prefer a larger look, it works great with rattail cord and 6/0 beads! 1. Prepare approximately 1 yard of Nymo by stretching it and passing it lightly over the Thread Heaven or wax and threading it through the needle. 2. Fold the leather cord over. About 1/2 inch down from the bend at the top, tie your thread onto one strand of the doubled leather cord. Hold the leather cord with the knot on the right. 3. Pick up a Silver lined Rainbow Orange bead, and pass the Nymo over the leather cord on the opposite (left) cord, going over the top of the cord. 4. Bring the Nymo around the bottom of the cord, and pass through the seed bead again. Keep the thread tension even and tight, so that the beads stay in place along the cord. 5. 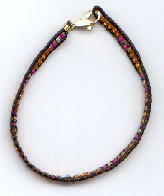 Bring the Nymo over the top of the right hand cord and up from the bottom, and add another seed bead. Pass the Nymo over the top of the cord on the left, and back up from beneath, and pass back through the bead again. You may find it easier to stitch by turning the cord over, with the loop down, when you pass back through the bead. 6. The bead pattern is as follows: 5 Silver lined Rainbow Orange, 1 Magenta color lined bead, 1 Gold bead, one Magenta color lined bead, repeat from the 5 Silver lined Rainbow Orange. 7. Repeat until the design is completed and your bracelet is of the proper length. 8. End by crimping the two loose ends of the leather cord in the fold-over leather crimper. 9. Add the small lobster clasp to the ring at the end of the fold-over. 10. Close the bracelet by simply attaching the lobster claw clasp to the loop of leather at the opposite end. This makes for a casual looking finish to this bracelet. If you prefer a more formal fastener, you can add a fold-over clasp at the looped end as well, and place a loop on that for closure. With this piece, as with many others, there are many variations you may try. It works up well on a larger scale, using size 8/0 or even 6/0 beads, and correspondingly larger leather cord, or even with silk rat-tail cord. It can be made longer, and is durable enough to work well as an anklet. It also makes a nice choker. I'm so pleased with the overwhelming response to the Lady Hawke web page and newsletters (over 1200 subscribers now). I love the fact that so many souls can find information and hopefully a bit of peace here. Unfortunately the traffic has used up most of the bandwidth (number of allowed page views per day) allowed on this free server which means that the page will shut down about half way through the month until the following month. In the near future I will be buying web space to place the Lady Hawke Site upon. If anyone is in a position to donate even a dollar to this cause I would appreciate it.